The A-4 Skyhawk was an attack aircraft originally designed to operate from United States Navy aircraft carriers. 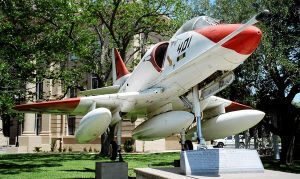 Fifty years after the type's first flight, some of the nearly 3,000 Skyhawks produced remain in service with smaller air arms around the world, including active duty on a carrier. The aircraft, designated the A4D under the US Navy's pre-1962 desigation system, was designed by the Douglas Aircraft Corporation (later McDonnell Douglas, now part of Boeing). The Navy issued a contract for the type on June 12 1952, and the first prototype first flew on June 22, 1954. Deliveries to Navy and U.S. Marine Corps squadrons commenced in late 1956. The Skyhawk remained in production until 1979, with a total of 2,960 aircraft built, including 555 two-seat trainers. The US Navy began removing the aircraft from its front-line squadrons in 1967, with the last retiring in 1975. The Marines would pass on the Navy's replacement, the A-7 Corsair II, instead keeping Skyhawks in service, and ordering the new A-4M. 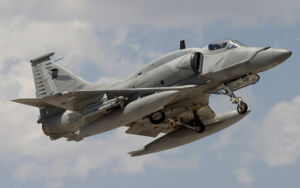 The last USMC Skyhawk was delivered in 1979, and were used until the mid-1980s until they were replaced by the similarly small, but STOVL AV-8 Harrier II. The Diamondbacks of VMA-131,Marine Aircraft Group 49 retired their last four OA-4Ms on June 22,1994. LtCol. George "Eagle" Lake III (CO), Major John "Baja" Rufo (XO), Captain Dave "Yoda" Hurston and Major Mike "Struts" Volland flew a final official USMC A-4 sortie during the A-4 Standdown Ceremony. Trainer versions of the Skyhawk remained in Navy service, however, finding a new lease on life with the advent of adversary training, where the nimble A-4 was used as a stand-in for the Mikoyan-Gurevich MiG-17 in dissimilar air combat training (DACT). It served in that role until 1999, when the last were replaced with the T-45 Goshawk. The A-4's nimble performance also made it suitable to replace the F-4 Phantom II when the services downsized their aircraft for the Blue Angels demonstration team, popularized on a 80s rock video, until the availability of the F/A-18 Hornet in the 1980s. 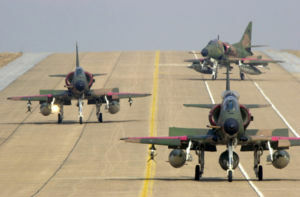 The last US Navy Skyhawks, TA-4J models belonging to composite squadron VC-8, remained in military use for target-towing and as adversary aircraft for combat training at Naval Air Station Roosevelt Roads. They were officially retired on May 3, 2003. The Skyhawk proved to be one of the most popular US naval aircraft exports of the postwar era. Due to its small size, it could be operated from the older, smaller World War II-era aircraft carriers still used by many smaller navies during the 1960s. These older ships were often unable to accommodate newer USN fighters such as the F-4 Phantom II and F-8 Crusader, which were faster and more capable than the A-4, but significantly larger and heavier than older naval fighters. The aircraft is of conventional post-WW2 design, with a low-mounted delta wing, tricycle undercarriage, and a single turbojet engine in the rear fuselage, with intakes on the fuselage sides. The tail is of cruciform design, with the horizontal stabilizer mounted above the fuselage. Armament consisted of two 20 mm Colt Mk 12 cannon, one in each wing root, with 200 rounds per gun, plus a large variety of bombs, rockets, and missiles carried on a hardpoint under the fuselage centreline and hardpoints under each wing (originally one per wing, later two). The A-4 pioneered the concept of "buddy" self air-to-air refueling. This allowed the aircraft to be used as a tanker for others of the same type, removing the need for entirely different tanker aircraft - a particular advantage for small air arms or when operating in remote locations. This worked by designating a tanker aircraft and fitting it with a centre-mounted "buddy store" that was a large external fuel tank with a hose reel in the aft section and an extensible drogue type refueling bucket. This aircraft was fuelled up without armament and launched prior to the attack aircraft. The attack aircraft were then armed up to the maximum and given only just enough fuel to bring them up to the maximum take-off weight. Once airborne, they would then proceed to top up their fuel tanks from the tanker using the A-4's inbuilt re-fuelling probe on the starboard side of the aircraft nose. They could then proceed to the target with both full armament and fuel loads. Whilst rarely used in US service after the KA-3 Skywarrior tanker became available, every Boeing F/A-18E/F Super Hornet is now built with this capability with a view to the imminent retirement of dedicated tankers. Shortly afterwards, Israeli Air Force Skyhawks would be the primary ground attack aircraft in the War of Attrition and the Yom Kippur War. They cost only 1/4 what a Phantom cost and carried more bombs and had longer range than the air superiority fighters they replaced. The Skyhawks bore the brunt of losses to sophisticated SA-6 Gainful missile batteries. They have been replaced by F-16s. During the Falklands Conflict, armed with iron bombs and lacking any electronic or missile self defense, Argentine Air Force Skyhawks sank HMS Coventry (D118), HMS Antelope (F170) and RFA Sir Galahad (1966) besides producing heavy damage to several others like HMS Glasgow (D88), HMS Argonaut, HMS Broadsword and RFA Sir Tristram. Argentine Navy A-4Q's also played a role in the bombing attacks against British ships, destroying HMS Ardent (F184). The A-4 Skyhawk was introduced to a training role in the two seat TA-4J configuration replacing the TF-9 Cougar as the advanced jet trainer The TA-4J served as the advanced jet trainer in white and orange markings for decades until being replaced by the T-45 Goshawk. Additional TA-4J Skyhawks were assigned to so-called Instrument Training RAGs at all the Navy master jet bases under RCVW-12 and RCVW-4. The Instrument RAGs initially provided jet transition training for Naval Aviators during the time period when Naval Aviation still had a great number of propellor driven aircraft and also provided annual instrument training and check rides for Naval Aviators. The assigned TA-4J models were installed with collapsable hoods so the aviator under training had to demonstrate instrument flying skills without any outside reference. These units were VF-126 at NAS Miramar, VA-127 (later VFA-127) at NAS Lemoore, VF-43 at NAS Oceana and VA-45 (later VF-45) at NAS Key West. Additional single seat A-4 Skyhawks were also assigned to composite squadrons (VC) worldwide to provide training and other services to deployed units. There were VC-1 at NAS Barber's Point, VC-2 at NAS Miramar, VC-5 at Cubi point, Republic of Philippines, VC-8 at NAS Roosevelt Roads, Puerto Rico, VC-10 at Guantanamo bay, Cuba, VC-12 (later VFC-12) at NAS Oceana and VC-13 at NAS Miramar. With renewed emphasis on Air Combat Maneuvering (ACM) training brought on with the establishment of the Navy Fighter Weapons School (TOPGUN) in 1968, the availability of A-4 Skyhawks in both the Instrument RAGs and Composite Squadrons at the Master Jet Bases presented a ready resource of the nimble Skyhawks that had become the TOPGUN preferred surrogate for the MiG-17. At the time, the F-4 Phantom was just being exploited to its full potential as a fighter and had not performed as well as expected against the smaller North Vietnamese MiG-17 and MiG-21 opponents. TOPGUN introduced the notion of Dissimilar Air Combat Training (DACT) using the A-4E in the striped "Mongoose" configuration with fixed slats. The small size of the Skyhawk and superb low speed handling in the hands of a well trained aviator made it ideal to teach fleet aviators the finer points of DACT. The squadrons eventually began to display vivid threat type paint schemes signifying their transition into the primary role of Adversary training. To better perform the Adversary role, single seat A-4E and F models were introduced into the role, but the ultimate Skyhawk was the "Super Fox", which was equipped with the uprated J52-P-408 engine similar to the configuration used by the Blue Angels. The surplus of former USMC Skyhawks resulted in A-4M versions being used by both VF-126 and TOPGUN. Even though the A-4 was augmented by the F-5E, F-21 (Kfir), F-16 and F/A-18 in the Adversary role, the A-4 remained a viable threat surrogate until it was retired by VF-43 in 1993 and shortly thereafter by VFC-12. The last A-4 fleet operators were VC-8 which retired their A-4 Skyhawks in 2003. YA4D-1 (YA-4A, later A-4A) Flight-test prototypes and pre-production aircraft. A4D-2 (A-4B) Strengthened aircraft and added air-to-air refueling capabilities, improved navigation and flight control systems, provision for AGM-12 Bullpup missile. 542 built. A-4P Remanufactured A-4Bs sold to Argentine Air Force known as A-4B by the Argentines. A-4Q Remanufactured A-4Bs sold to Argentine Navy. A4D-3 Proposed advanced avionics version, none built. A4D-2N (A-4C) Night/adverse weather version of A4D-2, with AN/APG-53A radar, autopilot, LABS low-altitude bombing system. Wright J65-W-20 engine with 8,200 lbf (36.5 kN) take-off thrust. 638 built. A-4L 100 A-4Cs remanufactured for Navy Reserve squadrons. A-4S 40 A-4Cs remanufactured for Republic of Singapore Air Force. A-4SU ("Super Skyhawk") This is an extensively modified and updated version of the A-4S. TA-4S 7 trainer versions of the above. Different from most Skyhawk trainers in that they have a second canopy for the instruction, rather than seating student and instructor under one long canopy. TA-4SU ("Super Skyhawk") This is an extensively modified and updated version of the TA-4S, fitted with a General Electric F404 non-afterburning turbofan engine, and modernised electronics. A-4PTM 40 A-4Cs and A-4Ls refurbished for Royal Malaysian Air Force, incorporating many A-4M features. TA-4PTM Small number of trainer versions of above. A4D-5 (A-4E) major upgrade, including new Pratt & Whitney J52-P-6A engine with 8,400 lbf (37 kN) thrust, strengthened airframe with two more weapon pylons (for a total of five), improved avionics, with TACAN, Doppler navigation radar, radar altimeter, toss-bombing computer, and AJB-3A low-altitude bombing system. Many later upgraded with J52-P-8 engine with 9,300 lbf (41 kN) thrust. 499 built. TA-4E two A-4Es modified as prototypes of a trainer version. A4D-6 Proposed version, none built. A-4F Refinement of A-4E with extra avionics housed in a hump on the fuselage spine (this feature later retrofitted to A-4Es and some A-4Cs) and more powerful J52-P-8A engine with 9,300 lbf (41 kN) thrust, later upgraded in service to J52-P-408 with 11,200 lbf (50 kN). 147 built. Some served with Blue Angels acrobatic team from 1973 to 1986. TA-4F Conversion trainer - standard A-4F with extra seat for an instructor. 241 built. OA-4M Twenty-three TA-4Fs modified for Forward Air Control duties for the USMC. EA-4F Four TA-4Fs converted for ECM training. TA-4J Dedicated trainer version based on A-4F, but lacking weapons systems, and with down-rated engine. 277 built new, and most TA-4Fs were later converted to this configuration. A-4G Eight aircraft built new for the Royal Australian Navy  with minor variations from the A-4F in particular they were not fitted with the avionics "hump". Subsequently, eight more A-4Fs were modified to this standard for the RAN. TA-4G two trainer versions of the A-4G built new, and two more modified from TA-4Fs. A-4H 90 aircraft for the Israeli Air Force based on the A-4F. Used 30 mm DEFA cannon with 150 rounds per gun in place of U.S. 20 mm guns. Later, some A-4Es later locally modified to this standard. Subsequently modified with extended jetpipes as protection against heat-seeking missiles. 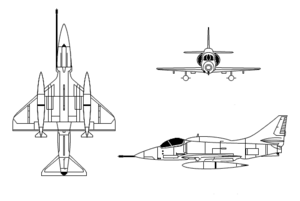 TA-4H 25 trainer versions of the above. These remain in service, and are being refurbished with new avionics and systems for service till at least 2010. A-4K Ten aircraft for Royal New Zealand Air Force. In the 1990s these were upgraded under Project KAHU with new radar and avionics, provision for AGM-65 Maverick, AIM-9 Sidewinder, and GBU-16 Paveway II laser-guided bomb. The RNZAF also rebuilt an A-4C and 10 A-4Gs to A4K standard. TA-4K Four trainer versions of the above. A fifth was later assembled in NZ from spare parts. The sale of ex-RNZAF A-4K and TA-4K aircraft to a private US flight training firm was announced in September 2005. A-4M dedicated Marine version with improved avionics and more powerful J52-P-408 engine with 11,200 lbf (50 kN) thrust, enlarged cockpit, IFF system. Later fitted with Hughes AN/ASB-19 Angle Rate Bombing System (ARBS) with TV and laser spot tracker. 158 built. A-4N 117 modified A-4Ms for the Israeli Air Force. A-4KU 30 modified A-4Ms for the Kuwaiti Air Force. Brazil purchased 20 of these second-hand and redesignated them AF-1. Now used in Brazilian Navy on carrier duty. TA-4KU 3 trainer versions of the above. Brazil purchased some of these second-hand and redesignated them AF-1A. A-4AR 36 A-4Ms refurbished for Argentina. Known as Fightinghawk. TA-4R Refurbished two-seat training version for Argentina. A-4Y Provisional designation of all A-4Ms. Never adopted by the US Navy or Marine Corps. Current operators of the A-4 in dark blue, former operators in light blue. 4th Air Brigade: received 25 A-4C in 1976 as they are. Refurbished and take to flight status by the Air Force technicians at Río Cuarto, Cordoba. 5 weapon pylons. Locally known as A-4C. 9 lost in the war. Survivors moved to 5th Air Brigade. 5th Air Brigade: received 25 A-4B in 1966 and other 25 in 1970 all refurbished in the United States prior their delivery as A-4P. 3 weapon pylons. Locally known as A-4B. They performed well at the Falklands, where they sunk HMS Coventry, HMS Antelope and RFA Sir Galahad. Ten of them were lost in the war. The survivors merged on this unit with the A-4Cs and upgraded under the halcon program with 30 mm guns, AAM missiles and other minor details. All withdrawn from use in 1999 and replaced with 36 units of the much improved OA/A-4AR Fightinghawk. Several TA-4J and A-4E airframes were also delivered under the A-4AR program mainly for spare parts use. 3rd Fighter/Attack Squadron: 16 A-4B plus 2 for spare parts, modified with 5 weapon pylons and to carry AAM AIM-9B Sidewinders. Known as A-4Q. Received in 1971 to replace F9F Panther and F9F Cougar in use from the aircraft carrier ARA Veinticinco de Mayo. 3 were lost in the Falklands War where they sunk HMS Ardent. After the War, the United States vetoed delivery by Israel of 24 A-4H as their replacement. Withdrawn from use in 1988 and unit disbanded. 20 AF-1 (ex-A-4KU) for use with aircraft carrier NAeL São Paulo for training purposes and combat. The Massachusetts-based non-profit organization operates one ex-US Navy TA-4J (BuNo 153524) as part of its "living history" flight program. It was acquired from AMARC in 2004, and is now based out of Houston, Texas. The organization offers licensed pilots the opportunity to purchase dual instruction time in the aircraft. Indonesia had used 37 A-4E/TA-4E Skyhawk II (ex-Israeli Air Force) until 2003. In 2003 they were replaced by 2 Russian Su-27SK and 2 Su-30MK. However, the Indonesian Air Force is planning to reactivate the A-4 Skyhawks by buying spare parts, after the U.S ended its weapons and spare part sales embargo. The Israeli Air Force once operated several squadrons of A-4's. Besides carrying out most of the hazardous bombing missions, one shot down a Syrian MiG-17 with unguided Air-to-Ground rockets. An A-4 was also involved in an unusual mid-air collision with an F-15 Eagle in 1983. The Eagle returned to base and landed despite losing its entire right wing. The A-4KU survivors of Operation Desert Storm were replaced by F/A-18 Hornet and sold to Brazil. In total, around 150 airframes, all A-4Bs and Cs, were purchased by Singapore. They joined the Republic of Singapore Air Force in the year 1974 and were upgraded three times. For the modernized A-4SU and TA-4SU versions, the original powerplants were replaced with that of an F/A-18 Hornet's, resulting in 30% less take-off time and overall increased thrust. The A-4SU series were referred to as Super Skyhawks. Max speed at sea level is 610 knots (1130 km/h), and max cruise speed at 30,000 ft (10,000 m) is 446 knots (826 km/h). These are two of the most advanced A-4 variants in the world. In 1998, the French government stepped in with an offer of facilities at Cazaux AB in the south of France. A 25-year lease for basing rights of 18 A4-SU aircraft and approximately 250 RSAF personnel and their families was signed later that year. Back in Singapore, 143 Sqn was disbanded in 1997, and its aircraft were handed over to 150 Sqn, which had given up its SIAI Marchetti SF.260 basic trainers. The new squadron then took up the role of advanced jet training, using its aircraft as a lead-in fighter trainer for RSAF pilots. This made it the prime candidate for moving to France, and the first of 18 aircraft were "packed" and sent to France by ship in mid-1999 as part of the RSAF’s Advanced Jet Training Program. They were retired in the year 2005 as well. On the 5th of October 2005, one A4-SU Skyhawk was delivered to Singapore Polytechnic as a teaching aid. Subsequently, Ngee Ann Polytechnic, Temasek Polytechnic and Nanyang Technological University would each receive a A4-SU Skyhawk as well. An initial order of 10 aircraft was made in 1966 comprising 8 single-seaters and 2 trainers; a further ten aircraft [8 single seat and 2 trainers] arrived in 1971. The first aircraft was delivered to the Royal Australian Navy on November 22 1967. 805 Squadron  (8 A-4G & briefly 2 TA-4G, followed by a total of 10 ex USN A-4F & TA-A4F modified to G standard. Withdrawn from use 1983). 10 aircraft lost in crashes. Occasionally a black knight logo (also from the game of chess) was used on the tail to differentiate VF-805 & VC-724 squadron aircraft. Otherwise over the life of the aircraft there were many different squadron aircraft paint schemes. VC-724 Squadron (6 A-4G plus 4 TA-4G, withdrawn from use 1982). This squadron was the Skyhawk Operational Flying School where pilots were converted to the A-4G and learnt the necessary operational skills. When VF-805 squadron ceased flying A-4Gs, its aircraft were reassigned to VC-724 squadron. Following the withdrawal of the A-4G from Australian service, 8 surviving A-4G and 2 TA-4G were sold to New Zealand's Royal New Zealand Air Force and were subsequently upgraded to A-4K specifications and later with the RNZAF "Kahu" program, with HOTAS, Maverick missile capability, and glass cockpit. Ironically the RAN paid for some of the New Zealand aircraft to undertake target towing and maritime strike training roles. A TA-4B model [a single seat airframe, the same physically as an A-4B], altered to appear like the A-4G models used by VF-805 squadron, has been loaned to Australia's Museum of Flight at HMAS Albatross [NAS Nowra] by the US Department of Navy. 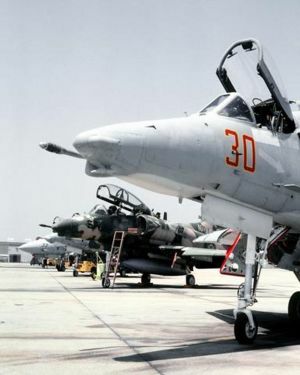 The Royal Malaysian Air Force acquired a total of 88 A-4C and A-4L aircraft, although only 40 were rebuilt to A-4PTM (Perculiar To Malaysia) standard, which included new bombing computer, body refurbishments and wirings. The remaining 48 aircraft were held for spare parts. These aircraft are stored at the Kuantan Air Force base on Malaysia's eastern coast. It has been replaced in the attack platform by the more sophisticated Boeing F/A-18D Night Strike Hornet (8 purchased), BAE Systems Hawk 200 (18 acquired) and BAE Systems Hawk 100 (10 acquired). 10 A-4K and 4 TA-4K were purchased by the Royal New Zealand Air Force in 1969 as English Electric Canberra replacements, and shipped to New Zealand aboard an aircraft carrier in 1970. The A4K is broadly comparable to the A-4F and G, although featuring extra avionics in a dorsal 'hump', as adopted by later A-4Fs, bent probe and drogue refuelling, and other minor changes. In 1984 10 ex-Australian A-4Gs were purchased. Under project KAHU, all aircraft updated to the A-4K Kahu standard, essentially by adopting the avionics from the F-16 Fighting Falcon, giving them the ability to use laser guided bombs, as well as AGM-65 Maverick and AIM-9L Sidewinder missiles. Kahu is Māori for falcon. Miniaturisation enabled the hump to be removed from the older New Zealand aircraft at the same time. The A-4Ks operated from Ohakea in New Zealand and Nowra in Australia equipped 2 and 75 Squadron RNZAF, as well as (briefly) 14 Squadron RNZAF, which operated the TA-4Ks prior to the delivery of BAC Strikemasters. The survivors were retired in 2001, and were to be sold in 2005 to a private U.S. flight training firm in a $150 million deal. However, this deal has been subject to delays from the U.S. State department due to concerns about allowing a squadron of reasonably capable combat aircraft to be operated privately in the United States. The aircraft are currently being stored at RNZAF Base Woodburne, just outside of Blenheim in the South Island. 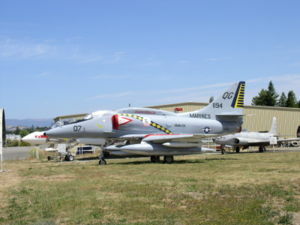 Two additional A-4Ks exist - one an ex-US early model brought up to the A-4K standard in the mid-1970s, solely for museum display; it is preserved at the Royal New Zealand Air Force Museum at Wigram, Christchurch. In 2001 another TA-4K Kahu was assembled in New Zealand entirely from spare parts, again for museum display; it is preserved at Ohakea. This is presumably the last 'production' A-4., ,. US Naval Air Reserve Squadrons at NAS Twin Cities, VA-811 and VA-813 also flew A-4A and A-4B aircraft 1963-69 or so. US Naval Air Reserve Squadrons at NAS Glenview, NAS Jacksonville, NAS Alameda, had A-4's. The Skyhawk was featured in some movies, most notably being the aggressor aircraft used by instructors in the movie Top Gun. It is also featured heavily in the animé series Area 88 and in the movie and novel The Sum of All Fears, where a Skyhawk's downing is a pivotal plot point. ↑ See Gordon Smith's website for complete reference. Grossnick, R. and Armstrong W.J. (1997). United States Naval Aviation, 1910-1995. Naval Historical Center. ISBN 0-16049-124-X. Dave Parsons & Derek Nelson (1993). Bandits, Pictorial History of American Adversarial Aircraft. Motorbooks International. ISBN 0-87938-623-1. This page was last edited on 5 March 2007, at 08:23.